Home > Events > SUM 2017 "SOLEIL Users’ Meeting"
SUM 2017 "SOLEIL Users’ Meeting"
The 12th SOLEIL Users’ Meeting will take place on January 19th and 20th, 2017 at Polytechnique (Palaiseau) and at SOLEIL. This invaluable forum for the synchrotron radiation users’ community will provide, this year, the opportunity to start thinking about the evolution of the machine and the beamlines. It will be also the occasion to share scientific, technical and practical issues about the synchrotron radiation use. The 3 plenary lectures will deal with different aspects related to recent and future synchrotron sources evolutions. Scientific communications will be presented during parallel sessions, selected from submitted abstracts (deadline for submission: November 21st, 2016). A social programme with a buffet dinner will be held at SOLEIL on the afternoon of January 19th in conjunction with the posters session, commercial exhibitions and visits of the Facility. On Friday afternoon, two satellite parallel sessions will be held at SOLEIL. We invite you to save the date. "Synchrotron light contribution to renal pathology"
"Architecture and assembly of an anti-bacterial weapon: the Type VI secretion system"
"Bimetallic catalyst formation and use in dehydrogenation reaction"
"Competing coexisting phases in 2D water"
"Spin to charge conversion at room temperature using the α-Sn topological insulator"
"Interlayer coupling through a dimensionality-induced magnetic state"
"Quantum tunnelling of particles within molecules: Synchrotron far-IR spectroscopy of malonaldehyde"
"Many-electron emission in understanding atoms and molecules - theory and experiment"
"Reactivity of sulfur and zinc nanoparticles formed in organic wastes after spreading"
Jean-Philippe Echard - Cité de la Musique (France) - "16th-18th-c. violins and lutes under the synchrotron beam: old scenes, new details"Antoine Barbier, CEA (France) - "Contribution of synchrotron radiation studies to the understanding of the magneto-electric coupling in the artificial multiferroic CoFe2O4/BaTiO3 system"
2 tutorials are organised on Friday afternoon, 20th of January, 2017. To keep informed the MX community of the progresses and developments of crystallographic softwares applied, two tutorials will be organised in the SUM2017 framework, on the afternoon of Friday, 20th of January, between 3 pm and 6 pm. The first tutorial will be dedicated to COOT (new features, ligand modeling...) and the second will focus on the new CCP4i2 GUI (description of the new workflow...). The last hour will be dedicated to answering specific and personalised questions on these two programs. The number of participants will be limited to 60 people. With the advent of 3rd generation synchrotron radiation facilities allowing a sub-second time resolution in the monitoring of kinetics by X-ray Absorption Spectroscopy (XAS), the experimentalist can now access to a deeper and more accurate temporal description of the chemical species involved in such processes provided that the bottleneck of the data analysis has been overcome. Indeed, users at the time-resolved XAS beamlines have to face with a huge amount of data in a couple of minutes making the common strategy of XAS data evaluation, reduction and analysis quite inefficient. New tools must be proposed to the users to interactively optimize the outcome of an experiment carried out at the beamline. In this framework, chemometric tools combining Principal Component Analysis (PCA) and Multivariate Curve Resolution optimized with Alternating Least Square (MCR-ALS) fitting are emerging as a powerful method to quantify and extract spectra of intermediate species from XAS spectra of evolving mixtures upon reaction [1-6]. At the ROCK beamline, a user-friendly interface has been recently developed to handle the huge amount of data collected upon reaction monitoring. Normalized matrices of several hundred absorption spectra are quickly generated after data recording which are directly suitable as input files for MCR-ALS analysis available on Matlab platform using free toolboxes developed by the Tauler’s group . In this tutorial, after a short introduction to the chemometric methods applied to XAS, a practical session with the skills used at the ROCK beamline for the chemical speciation determined by MCR-ALS fitting of a Quick-XAS data set recorded upon reaction will be carried out. As the practical required computers and Matlab platform, the number of attendees will be limited to 20. W. Cassinelli, L. Martins, A. R. Passos, S. H. Pulcinelli, C. V. Santilli, A. Rochet, V. Briois, Cat. Today 229, 114 (2014). J. Hong, E. Marceau, A. Khodakov, L. Gaberova, A. Griboval-Constant, Jean-Sebastien Girardon, C. La Fontaine, V. Briois, ACS Catal. 5, 1273 (2014). H.W. P. Carvalho, S. H. Pulcinelli, C. V. Santilli, F. Leroux, F. Meneau, V. Briois, Chem. Mater. 25, 2855 (2013). A. Rochet, B. Baubet, V. Moizan, C. Pichon, V. Briois, Comptes Rendus Chimie (2016) http://dx.doi.org/10.1016/j.crci.2016.01.009. A. Voronov, A. Urakawa, W. van Beek, N. E. Tsakoumis, H. Emercih, M. Ronning, Analytica Chimica Acta, 840, 20, (2014). M. Staniuk, O. Hirsch, N. Kränzlin, R. Bölhen, W. van Beek, P. M. Abdala, D. Koziej, Chem. Mater. 26, 2086 (20134). J. Jaumot, A. de Juan, R ; Tauler, Chemom. Intell. Lab. Syst.140, 1, (2015). A posters session will be held at SOLEIL on January 19th 2017. Posters panels will be located in the Hall of SOLEILCentral Building. This is a mission to a congress up to 1000 € (with original tickets). The Award will be held on 2017/01/19 evening, during the buffet. For the Best Poster Award, the attendence of the candidate is requested. The registration fee is 100 €. It includes: attendance at the users meeting, buffets, lunches and coffee break, and transfers by bus. SOLEIL Users Meeting: SUM_17 / 69160602. Or, if you are already registered, by clicking on the link. The yearly SOLEIL Users’ Meeting will be held both at Polytechnique School and SOLEIL, starting on Thursday 19th until Friday 20th of January 2017. We offer during the poster session which will take place at SOLEIL a few exhibition areas to companies interested in presenting their products located in the Hall of the Main building of SOLEIL, giving the opportunity for easy interaction between exhibitors, visitors, attendees and the SOLEIL staff. The area available, of about 4 m2, is one table and 4 chairs. • for 2 persons: access to plenary and parallel sessions as well as the technical workshops, the Company’s logo on the web site and the list of Commercial Exhibitors with the Company’s logo into the electronic abstract book, coffee-breaks, the cocktail of the 19th of January and the lunches (January 19th and 20th). The exhibitors can also insert an advertising page into the electronic abstract book of the Users’ Meeting, for a supplementary 360,00 € all taxes included (300 € without taxes) amount. Use ONLY the Main Entrance of Polytechnique site. The car place « Cour des cérémonies » is reserved to the Users’ Meeting. The Entrance to the Conference is only possible from « Cour d’Honneur ou Vaneau ». Open hours are the following: from 8:30 to 12:00. If you plan to come after 12:00, please go to the new Polytechnique Reception Desk - « Cour Ferrié » (see the map). The access to the buildings is ONLY possible from the bus stop « Lozère ». Please, go to the Polytechnique Reception Desk and ring to the interphone to mention your Users’ Meeting attendance. SOLEIL reception desk will be near ARAGO auditorium, as usual. 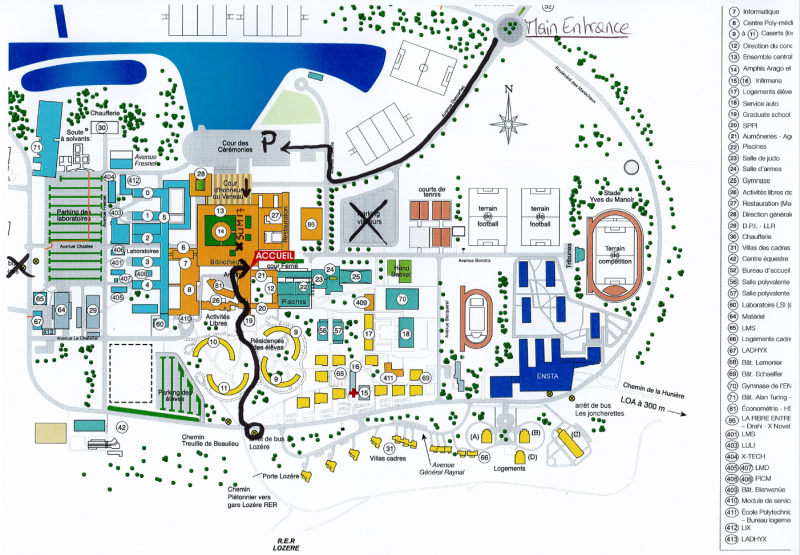 Please, follow the arrows to reach the Conference. "MASSY-PALAISEAU" station - BUS n°91-06 B ou C direction to SAINT-QUENTIN GARE, stop at “L’ORME DES MERISIERS”. 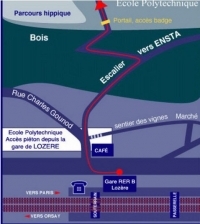 "LE GUICHET" station - walk to the bus station, take bus n°9, direction to SACLAY, stop at "L’ORME DES MERISIERS". "GIF SUR YVETTE" station, take bus n° 10, stop at "SAINT AUBIN". From ORLY Airport - ORLYVAL train, stop at ANTONY, take the RER B (then same as above) or BUS n°91-10 direction "Christ / N306, Saclay", stop at "L'ORME DES MERISIERS" (around 1h - end of service at 9 p.m).